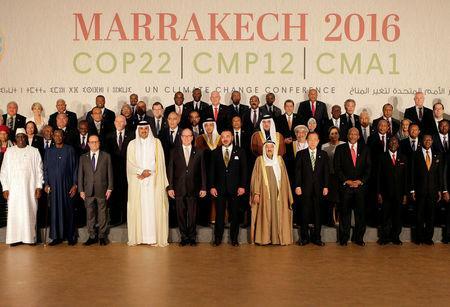 MARRAKESH, Morocco (Reuters) - France and the United Nations on Tuesday stepped up warnings to U.S. President-elect Donald Trump about the risks of quitting a 2015 global plan to combat climate change, saying a historic shift from fossil fuels is unstoppable. French President Francois Hollande, addressing almost 200 nations meeting in Morocco on ways to slow global warming, said that inaction would be "disastrous for future generations and it would be dangerous for peace". Both he and U.N. Secretary-General Ban Ki-moon called on Trump, who has called man-made global warming a hoax, to drop a campaign pledge to cancel the global 2015 Paris Agreement that aims to shift from fossil fuels to cleaner energies. "The United States, the largest economic power in the world, the second largest greenhouse gas emitter, must respect the commitments it has undertaken," Hollande said to applause. The agreement was "irreversible", he said. In such U.N. meetings, it is very rare for leaders to single out others for even veiled criticism. 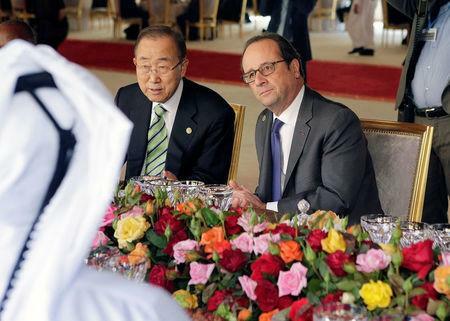 Both Hollande and Ban were among the architects of the Paris Agreement. "What was once unthinkable has become unstoppable," Ban said at a news conference of the Paris deal, agreed by almost 200 governments last year after two decades of tortuous negotiations. The accord formally entered into force on Nov. 4 after a record swift ratification. Ban said Trump, as a "very successful business person", would understand that market forces were driving the world economy towards cleaner energies such as wind and solar power, which are becoming cheaper, and away from fossil fuels. "I am sure he will make a fast and wise decision" on the Paris Agreement, Ban said, saying he had spoken to Trump by telephone after his victory and planned to meet him. 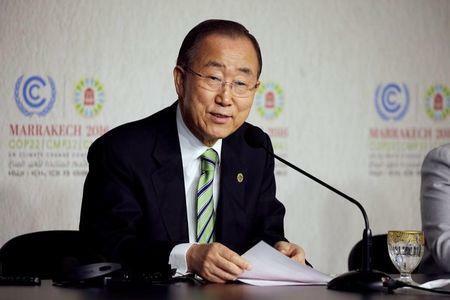 Ban, who has made climate change a core part of his 10-year U.N. stewardship ending this year, said climate change was having severe impacts from the Arctic to Antarctica and that 2016 is on track to be the warmest year on record. Trump has said he wants to boost the U.S. coal, oil and shale industries, abandoning President Barack Obama's plan to cut greenhouse gas emissions by 26-28 percent below 2005 levels by 2025. The Paris accord, aiming to phase out net greenhouse gas emissions this century, was driven by increased scientific certainty that man-made emissions drive heat waves, floods and rising sea levels. Ban said that companies including General Mills and Kellogg , states such as California and cities such as Nashville and Las Vegas were working to cut their greenhouse gas emissions. Trump's victory has overshadowed the Nov. 7-18 Marrakesh meeting, which had opened with congratulations after the entry into force of the agreement on Nov. 4. It now has formal backing from 110 nations including the United States. Dozens of nations, from Chile to Liberia, reaffirmed support for the Paris Agreement at the talks, with many saying they were already suffering from rising temperatures. Saudi Energy Minister Khalid al-Falih said that OPEC's biggest producer was "committed to meeting the world’s energy needs via the gradual transition towards a more environmentally sustainable future." "It's a matter of life and death," Zimbabwe's President Robert Mugabe said of tackling climate change, accusing rich nations of often ignoring the needs of the poor. "Let's not squander the Paris Agreement through old bad habits," he said. U.S. Secretary of State John Kerry will be among those addressing the conference on Wednesday. Trump's victory has lifted shares in coal producers, while knocking renewable energies. Shares in coal producer Peabody, in bankruptcy proceedings,[BTUUQ.PK] have surged 63 percent since the election, and shares in Arch Coal in the United States were up 19 percent. By contrast, the S&P Global Clean Energy Index has fallen to around its lowest level since June. Shares in Denmark's Vestas, the world's biggest wind turbine maker, are down 6 percent from the U.S. election day on Nov. 8. Benjamin Sporton, chief executive of the World Coal Association, told Reuters that although Trump would "make life a little bit better for coal in the United States" it would not solve many underlying problems. "The fundamental pressure is from the low prices of shale gas and that means that there will be a lot of challenges to the expansion of coal," he said. A source on Trump's transition team said the president-elect is seeking ways of withdrawing from the Paris Agreement within a year, by-passing a theoretical four-year wait. Delegates in Marrakesh say that U.S. withdrawal could dent other nations' willingness to work with Trump on other issues he cares about, such as immigration, trade or terrorism.